The trade show flooring for trade show booths and exhibitions are of great value as it adds style quotient to the trade show booths. These trade show flooring helps to get a unique trade show graphic for your flooring. The inter-locking design in these trade show flooring is extremely helpful as it helps to have an easy set up. 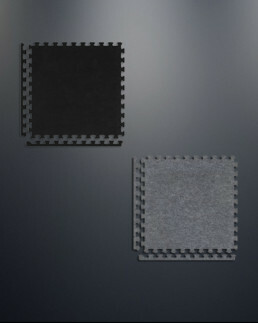 These Trade Show Flooring is available is various colors such as grey and black. 10' W x 10' L x 1/2" H.
Available in BLACK and GRAY color.